The next-generation PocketRocket® Deluxe stove takes everything impressive about the iconic PocketRocket and combines it with a Piezo igniter making it more convenient than the last but still offers being small and light with a high-performance design. Our smallest and lightest ultra-pack-efficient cook set for soloists. The size of a large mug, the Trail Mini Solo Cook Set delivers the essentials you need to fuel up—all in a cook kit that’s ridiculously small in your pack. Perfectly sized to make hot water for one pouch meal or a generous cup of coffee, its pot plays double duty as you eat-and-drink vessel. Inside, it nests a PocketRocket® 2 stove and 4 oz. MSR fuel canister. Outside, its bowl efficiently adds a second vessel, making this the ultimate space-maximizing cook set for solo minimalists moving fast with a small pack. A lighter option at only 203g perfect for a minimalist meal for one in this compact and efficient set. Being able to compact: PocketRocket 2 stove, 4-oz fuel and handle inside with the plastic pot and lid on the outside. When I first got the stove and pot I was excited to see the latest offering from MSR Gear, having heard good things about the previous PocketRocket2 the latest PocketRocket with the igniter could only mean improvements which was the case at first upon first use out. However, further testing in varied conditions drew to a different conclusion. Firstly, the new PocketRocket has had a redesign and extra pieces built on. Not only the new and convenient igniter to the side but also a new burner which is broader and concaved to help against poor weather and wind but keeps the offering in the same compact and lightweight package as previous models with this new design weighing a small 83g but offers up the quick boil times and constant power throughout use. Combined with the Trail Mini Solo cook set the two are a great combination for those hiking and wishing to keep weight down and reduce pack size. I didn't have to wait long to try the PocketRocket in poor weather with the first proper outing along the South Pembrokeshire coast at Castlemartin. With a route planned from St Govan’s chapel and to walk along the coastal path to Elegug Stacks and Green Bridge, it was an early start at 4am to try and catch a sunrise however with the latest weather this wasn’t happening. In packing the bag I was thankful the stove, pot and gas combined could fit in to a small package which was no larger than a large gas canister so keeping my pack light was no difficult in this respect and in set up in the dark was easy to pull out the pots and get cooking within seconds. The newly designed broader burner is excellent to say the least and the stormy coastal weather and high winds blowing in was no hard feet for the burner to continue through even with heavy showers and this was the same in the Brecon Beacon’s the following weekend and cooking in the clouds or lower in the car parks. Wind or rain the burner just keeps going! The igniter is a handy feature to include in this tiny package. Not many stoves of this size from competitors have included the igniters built in and to be able to keep the weight down is a clever feet of design. Although handy to have and yes, the igniter still works in the poor weather it doesn’t always light on the first click. It’s very sporadic to say the least and some attempts the igniter wouldn’t do anything so in frustration I would swap to using the old-fashioned method of matches or lighter. Of all the occasions the igniter wouldn’t work in the better weather and would work on first click in the worse conditions, so I can’t blame the wind for blowing out the flame before getting the pot on to boil. So, with this in mind I wouldn’t rely on just taking the stove out and not carrying matches or a lighter with me. The important thing is you can still light the stove in other methods. I used two gas cartridges other the course of the weekends. One, nearly empty and the second two-thirds full and using the two I noticed no change in consistency between strength the two cartridges being used. Even up the empty cartridge running out the flame remained consistent till the end and then just went when the fuel ran out. Keeping this consistency is good and nice to have, I don’t want my stove to be affected just because I’m using different levels of gas. In the poor weather cooking time remained consistent as it was to good weather and on average the water was boiling at 4 minutes for the 0.75L pot. This wasn’t at full power, so it could be quicker. I personally didn’t get on with the size of the pot. I found 0.75L was a little small for myself as I like a large coffee with my food, between water for the dehydrated packs and for a large coffee I need to boil just a little extra after sharing out the quantities. If you aren’t greedy like myself then the pot is ample big enough. 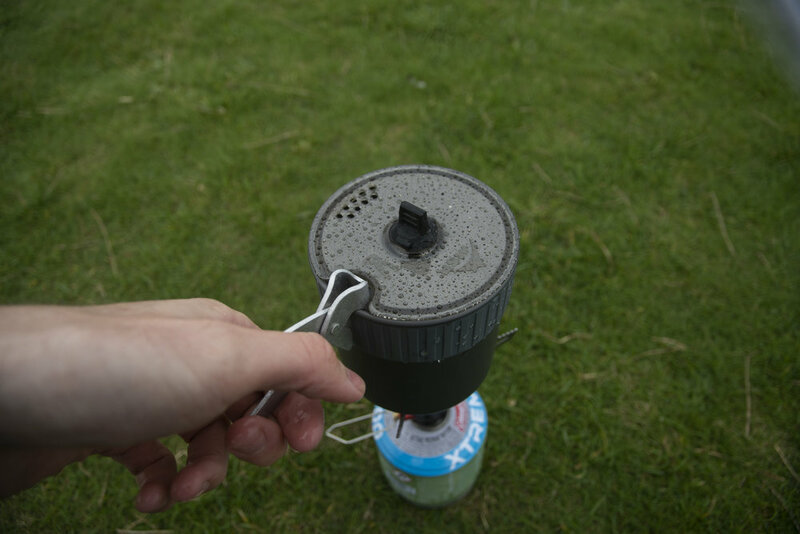 The pot is the perfect size however for cooking up plenty of water for just dehydrated packs. It is possible to cook a pack inside the pot, but care is required as it is small, so the dehydrated packs are a better option in combination with this set up. I found the pot handle pretty useless to be blunt and didn’t get on with this at all. It’s a little awkward to pick the pot up when full of water and to make matters worse if the pot has been cooking you have hot water with an awkward handle. I just found the handle doesn’t grip the side of the pot particularly well in wet conditions. I would personally prefer to see the handle built in to the pot for added stability and this won’t make the pot any larger or heavier if the handles fold in. The plastic cup that comes with the pot is interesting in the construction and idea but this as far as I would rate the product. The plastic cup isn’t strong or insulated so if you are using it for hot coffee or tea, care is needed and a pair of gloves to hold the cup, I also noticed with the hot liquids inside the pot would bow but would always return to its shape after. This is just as well, otherwise it would make packing the cooking set back down rather awkward. Before cooking it is also worth taking a little extra time to ensure you have removed the pot from the cooking pot before cooking. In a rush I forgot and managed to burn the plastic pot. My experience with the new PocketRocket has been mixed. I’m thoroughly impressed with the compact, lightweight option and durability in poor weather from the stove. The stove as a whole is great if you can get over the sporadic igniter, it’s great to see this included on such a small option but it’s not perfect and from my trips out with the stove I found it was very random in when it would work and in the most unlikely of locations vs good conditions. Igniter would work in strong winds and heavy rain on the coast or 850m on a mountain side but in a car park in the valleys wouldn’t catch or would take numerous attempts to get to work. As this item is a sample product perhaps the final consumer edition that hits shops might be better but from my testing I wouldn’t leave the house with just this stove and not carry another source to light the stove. Ignoring this issue, the stove is superb, lightweight and compact and easy to use and set up, the new broader burner is excellent at protecting the flame from wind and rain and as a whole is a great little set up for solo hikers. As for the Mini Solo cook set, again mixed feelings with this set. The handle I found pretty poor and difficult to use with big hands and struggled to keep the pot steady when full of water. The pot was ample big enough to boil up enough water for a small coffee and water for a dehydrated pack, but I prefer a large coffee, and this needed extra water boiling in order to fulfil my needs. There is no denying however how small, compact and lightweight the cook set and stove combined is. 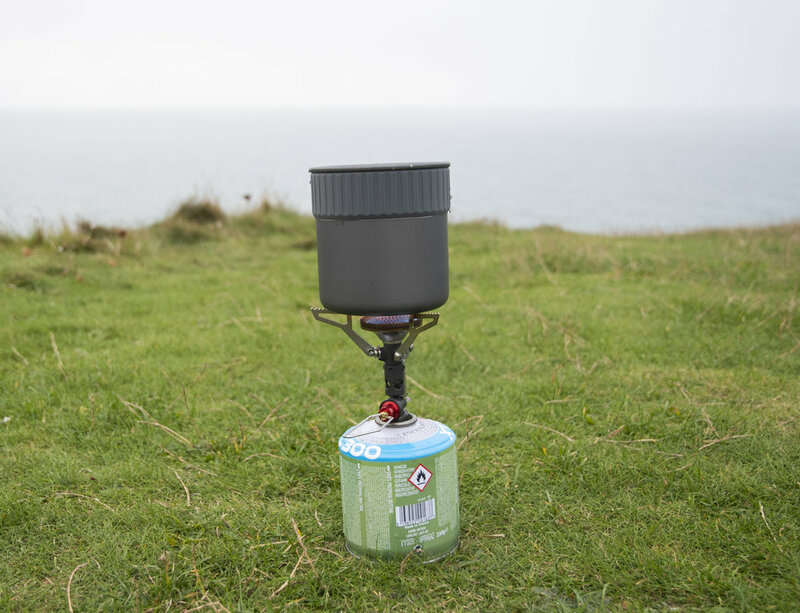 It takes up little to no room at all and the two combined weighs less than 300g and you can stove a fuel cartridge inside the pot as well as a fold up spoon, handle and stove. A few minor tweaks and I think the set are on for a real winner with solo hikers all round. Boil times were consistent with little to no gas or full and even in poor weather vs good weather the time to get water up to temperature ready for cooking was quick. At full power I could get the pot bubbling away around 3 minutes but had the ability to reduce power and have a gentle simmer if required. It’s super lightweight and better yet compact. Everything can pack in to the pot which is smaller than C500 gas cartridge. For a solo hiker looking to keep weight and pack size down this is in a different league of its own. Easy to set up, the pot pulls apart quite simply and the stove simply twist the arms out and attach to the cartridge. The igniter is simple (when it wants to work) with just a click of the button or simply use matches/lighter to ignite the stove. As with most compact stoves the arms can be a little confusing at first and is like an origami art to fold back in but once you have the knack of it it’s easy.